Allie Brosh has a gift for depicting hard truths in an easily digestible - and often hilarious - format. Her recognizable illustrative style is deliberately rough and simple and invites everyone to enter her wack-a-doodle world and find reflections of themselves and others there. She finds the humor in the darkest of situations, and the darkness in humorous situations, never quite letting us forget the yin and yang, the contrast that heightens each. Mental illness is a tough subject and Brosh approaches it with startling honesty and transparency. I've never seen or read a better description of depression than her two-part blog post recreated as part of her book. Of course, depression can be different for each person, but based on my experience with post-partum depression after my oldest was born, she hits the nail on the head when she described the, "detached, meaningless fog," the shame and self-loathing that accompany the sadness and lack of ability to come up with any appropriate emotional response to situations. What's most remarkable to me is how she captures the reactions of other people to her depression and how often, because of ignorance and with the best of intentions, they suggest a "solution...for a different problem than the one I have." 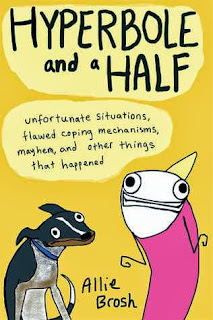 She highlights the absurdity and humor in the "existential confusion" of depression without losing the humanity of it. Animals are an endless source of amusement in the book. I laughed out loud at how their "simple dog" becomes "situationally quadriplegic" when it's time to leave the dog park. And the story of when they were attacked by a goose in their own home (complete with actual photos of the event) had me literally crying I was laughing so hard. And the toy parrot. Oh my word, the parrot! "The toy parrot was given to us by a family friend who either didn't understand children or hated my parents. "Imagine a grizzly bear. Now imagine that by some accident of nature, the bear sprouts wings and learns how to use a flamethrower. That would be a really unfair thing to have happen. Bears are already powerful enough without those things. "Similarly, children are already annoying enough without access to a toy that will record and repeat any sound in the entire world. "We began abusing the parrot's capabilities almost immediately..."
Brosh's "confident battle toward adequacy" may not speak to everyone. Her brash, deceptively flippant style may come across as too much for some, her brightly colored illustrations too jarring against the darkness of the truths she shares, but for those it reaches, it's such a relief to have found someone who sees the same darkness and absurdities in life. ** Major, major, major language warning. Do not pick up this book (or go to her blog) if you are not willing to see many, many f-words, as well as various other profanities and obscenities.